This is my place to share with family and friends. 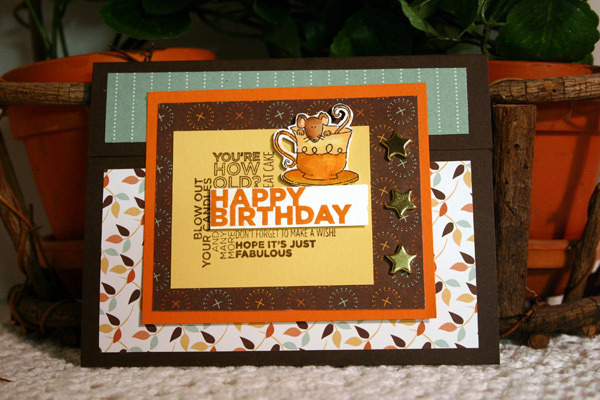 You might find handmade cards, digital scrapbook pages, photos or a little chatter because those are the things I love. My blog is a work in progress, so be patient with me. Most of the time I think I will be talking to myself, but hey, I'm used to that! I have a couple of cards to share today. The first I made for my sister Chris' birthday. I just love red and black with Kraft. The colors did not photograph that well this time but I was too lazy to take the photo again. The colors are more vibrant and the scallop is actually SU red Glimmer paper which is very sparkly. Paper: SU cardstock: Basic Black, Whisper White, and Crumb Cake. Scallop- Red Glimmer paper. SU Designer Paper: the musical staff from the retired Newsprint paper pack, and the floral print from the Bella Bleu pack, also retired. 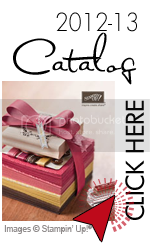 Accessories: Real Real Satin ribbon, Fiskars border punch. Nestibilities. This second card I made for a workshop make and take. We haven't had any snow yet this year but working with the snowman makes me want some. I love this cute stamp set and and was inspired by this great easel card by jeny_79 at SplitcoastStampers. Accessories: SU Markers: Cherry Cobbler, Marina Mist, Old Olive, and Pumpkin Pie. Nestibilities. Snow is bit of cotton ball. 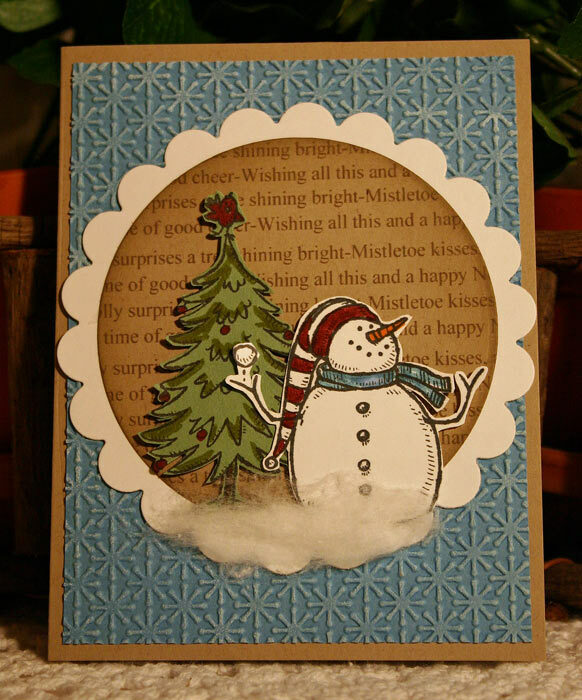 Snow Burst embossing folder. First up, a scrapbook page for my family album. Yep, that is me in Grade 4. I was such a little Tomboy then. Cardstock: Baja Breeze, Certainly Celery, Not Quite Navy and Whisper White. Ink: Basic Black and Night of Navy Classic. Designer paper is retired "Green Tea". Stamps: "Fifth Avenue Floral." 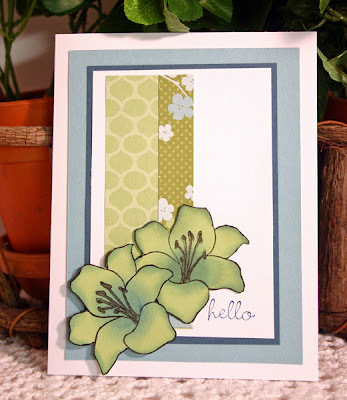 Cardstock: Stampin' Up! 's Early Espresso, Pumpkin Pie, So Saffron, and Whisper White. 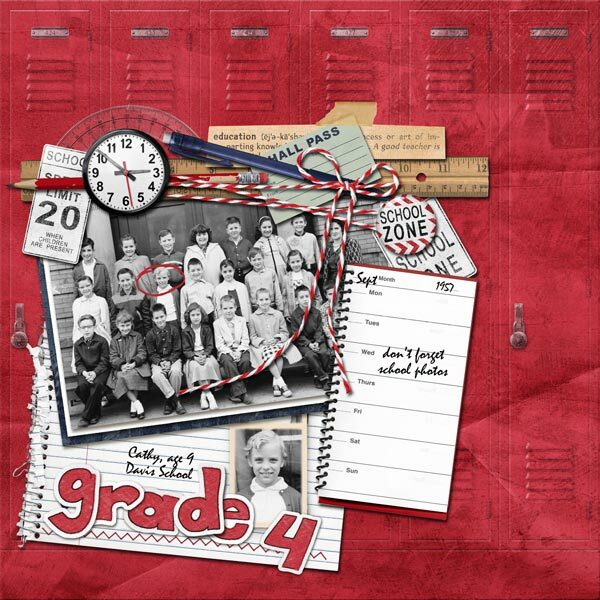 Stamps: Retired incentive stamp (mouse in cup), and Delightful Dozen stamps. Ink: Early Espresso and Pumpkin Pie. Retired DSP, "Autumn Vine". Stampin' Write Markers. Generic brass star brads. Cardstock: Not Quite Navy and Whisper White, Designer paper is Paisley Petals . Stamp is from "Four Frames" which fits the Decorative Label punch. Ink is Not Quite Navy. Accessories: Bashful Blue grosgrain ribbon. 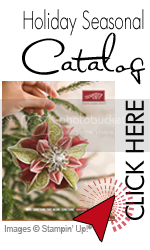 SU embossing folder Finial Press. My daughter Carol gave me some beautiful Brandywine tomatoes that were still green so I decided to try making some fried green tomatoes. Now I had never tasted these so I was taking the word of the southerners I know that they were a real treat. The green tomatoes were so pretty I had to take a photo. I found a highly rated recipe on the web and started cooking. (or should I say frying?) Fried foods are not seen too often at our house so you can believe me when I tell you, I went through a roll of paper towels, draining and blotting these babies off. Truth be told, they were delish and we totally enjoyed them. 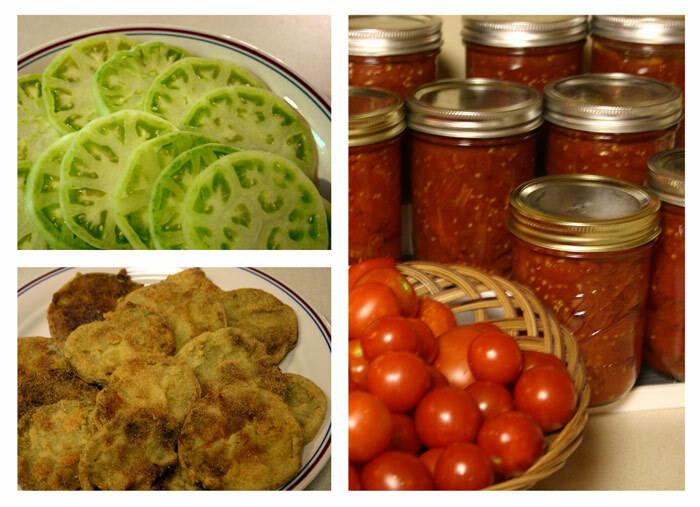 The other photos show the tomatoes after frying and some of my tomatoes I have canned. 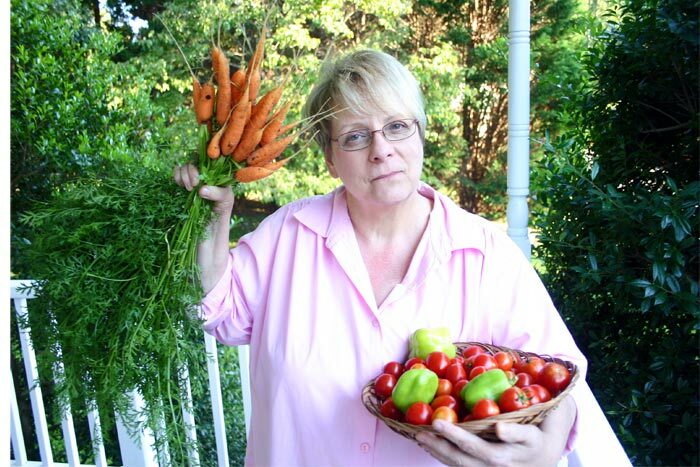 Note to self: plant fewer cherry tomatoes next year. Thanks for checking in at my blog. I will have some cards next post. If you would like to try this and have some green tomatoes, here is the recipe I used . Last weekend I had a workshop focusing on sponging and reverse masking. We made three clean and simple cards using those techniques. We all had such a good time making these, I will definitely do another workshop using sponging. 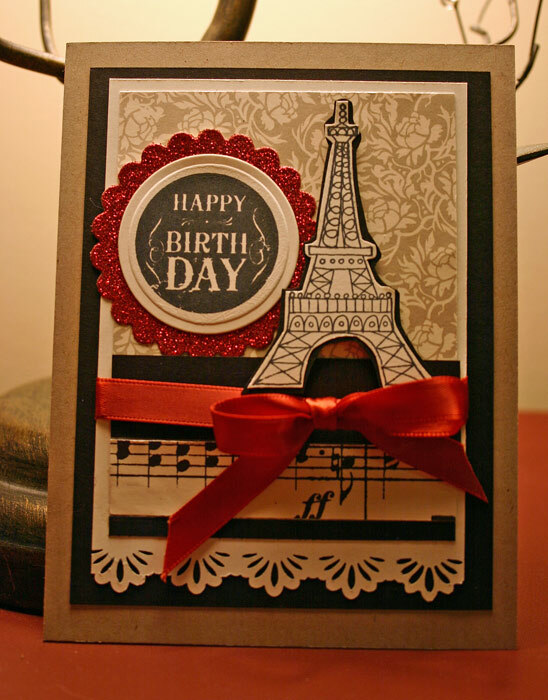 First is a simple birthday card. Sorry about the glare on the black cardstock. Black does not photograph well. I always seem to get a glare. I used painter's tape to mask off the edges of the sponged area. Make sure you get some of the "sticky" off the tape first by putting it on your clothing or an old tee. All from Stampin' Up! 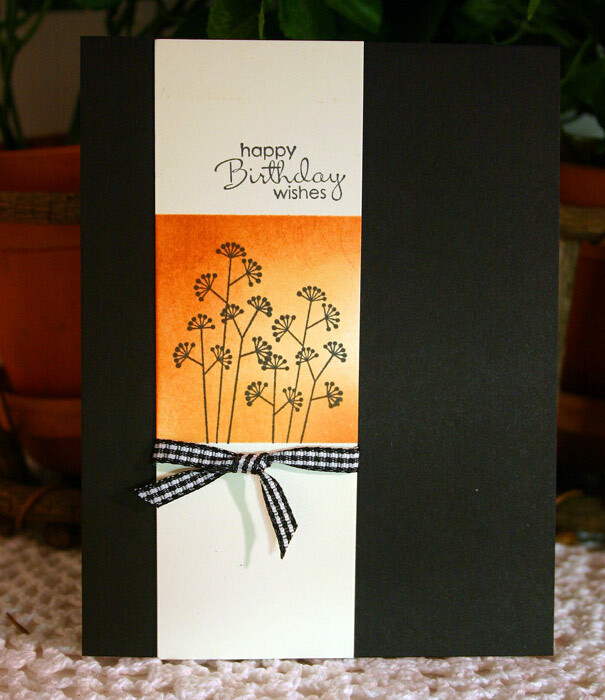 Cardstock: Basic Black, Very Vanilla. Stamps: Pocket Silhouettes, Petite Pairs. Ink: So Saffron, Cajun Craze and Basic Black. Ribbon Black and White checked Gingham (Ret). 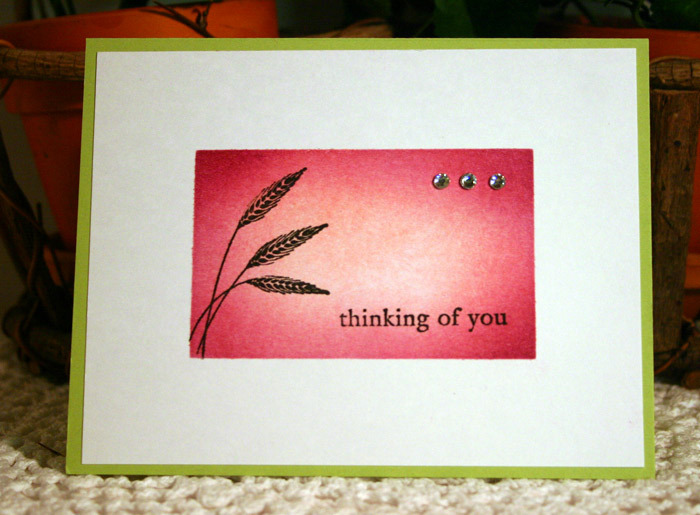 Next a super-simple thinking of you card. You could use different colors of ink to suit your taste instead of the pinks. I think this would work really well in the sunset colors. Painter's tape used again. Supplies all from Stampin' Up! 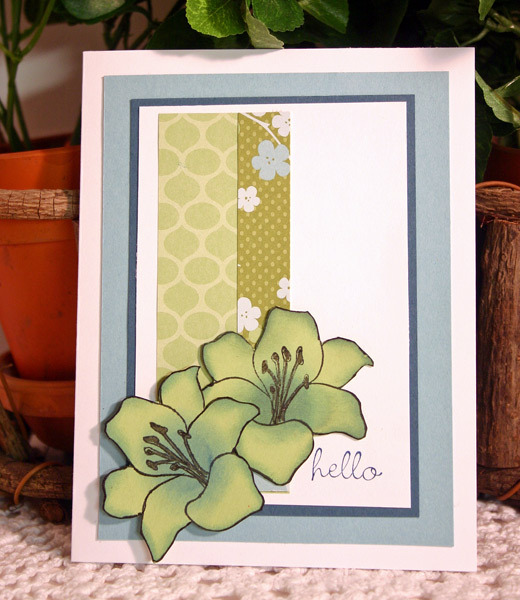 Cardstock: Whisper White and Certainly Celery. Stamps: Autumn Days and Three Little Words. Ink: Perfect Pink Pirouette, Pretty In Pink and Rich Razzleberry. Basic Rhinestones accents. 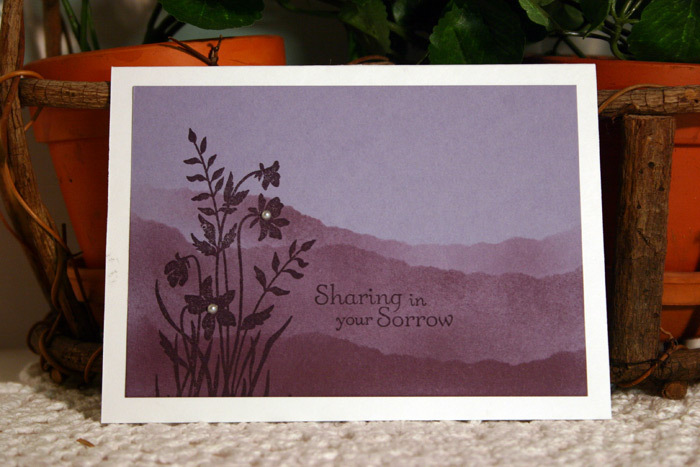 This last one is a sympathy card. I think it is very serene and calming. I used torn paper to do the masking for the hills. Another clean and simple card. Supplies all from Stampin' Up! 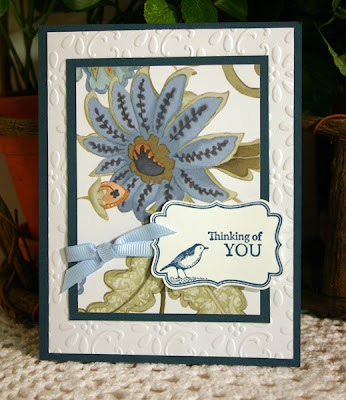 Cardstock: Whisper White and Wisteria Wonder. Stamps: Just Believe and Thoughts and Prayers. Ink: Perfect Plum and Elegant Eggplant. Basic Pearls accents. The garden has turned into a jungle! I can hardly turn around in there. The cherry tomatoes especially have gone wild. 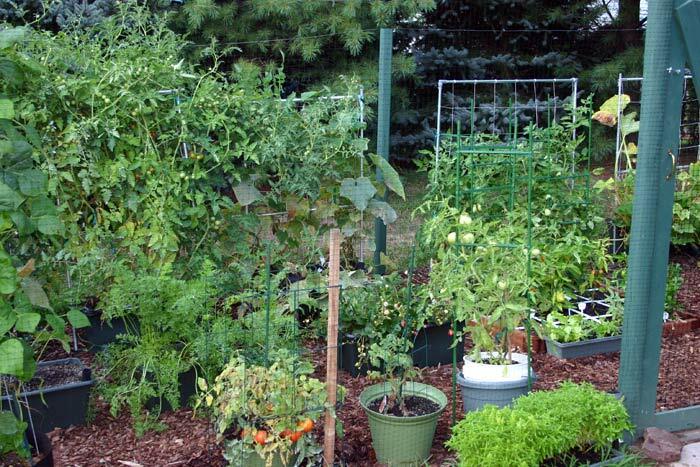 Note to self: next year, only plant one cherry tomato. 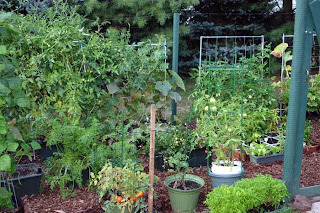 It is not the size of the tomatoes that makes them monsters but the vines have taken over three trellises. The good part of dealing with the jungle. 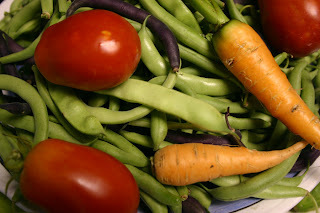 Maters, beans and carrots. Yum! I have to name all my cards that I photograph for my gallery so there will be some way to organize them if I need to find them again. I've noticed that some stampers seem to come up with such clever names for their cards. Me, not so much. So here is another card with a lame name "Butterflies in the Grass"
Supplies all from Stampin' Up! 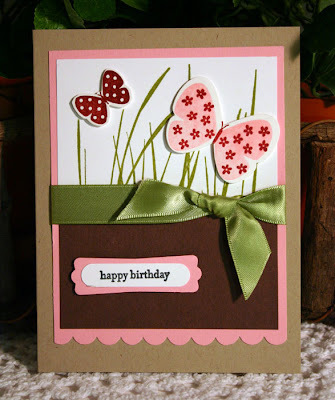 Cardstock: Crumb Cake, Pretty In Pink, Chocolate Chip, and Whisper White. Ink Old Olive, Basic Black, Pretty In Pink, and Cherry Cobbler. 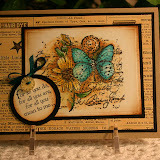 Stamps: Inspired by Nature, Butterflies in Flight, and sentiment from Teeny Tiny Wishes. Ribbon- Old Olive Satin 5/8 inch. Punches: Word Window and Modern Label, and Scallop Edge Border. Your independent Stampin Up! demonstrator. Yes, I've had the same photo for a while now, and no, I am not changing it any time soon, lol!